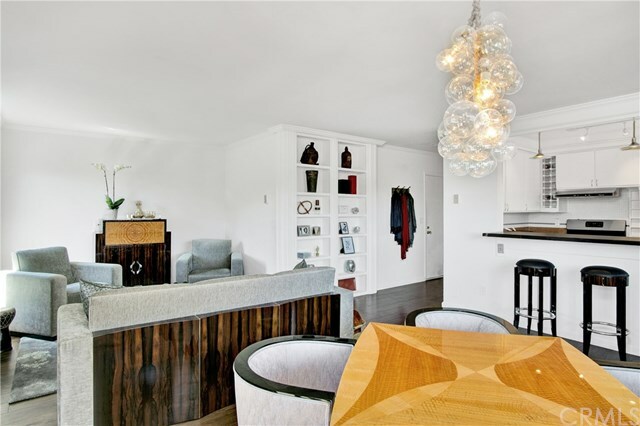 Welcome home to this top floor corner unit in an unbeatable WeHo "Norma Triangle" location near Beverly Hills!Â Nestled on a quiet street corner, conveniently located between Sunset and Santa Monica Blvd, this penthouse-esque home with tree top views has it all. By far one of the best units in the building, step off the elevator and directly into the sensible open floor plan. This unit perfectly combines old world charm (crown moulding, farmhouse ceiling in the kitchen, ornate window frames and a classic floor-to-ceiling shelving unit) and modern flare (updated windows, A/C, and hardwood throughout). The kitchen - equipped with two breakfast bars, butcher block counters, ample storage and generous counter space - opens up to the living room and dining area with custom chandelier. Natural light and that famous California breeze flood in through the many windows and sliding glass door. The large wraparound balcony is ideal for enjoying your morning coffee or glass of wine at the end of a the day. The bedroom, with a newly installed Minka ceiling fan, is generous in size and light, with stretching windows and mirrored closet doors. The large closet's custom shelving unit and multiple hanging racks offer plenty of storage. The gorgeous full bathroom has an elegant spa-like feel. There is gated secure parking, but why drive when so many local, hip restaurants and shops are within walking distance? Freshly painted and cleaned, this home is ready for its new perfect owner! Come see!